for Hergé (author and illustrator). Disclaimer Links. Books read recently. Best books read. 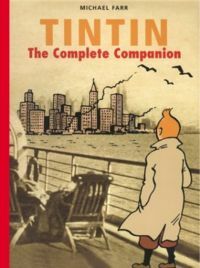 Tintin: The Complete Companion written by Michael Farr. Alphabetic list of Tintin books. Chronological list Tintin books. Became seen as a very important European cartoonists of the 20th century. Wrote stories that he illustrated with his own accurate, vivid, and detailed drawings. Told the story through dialog bubbles in his drawings. Started in 1928, publishing his stories first as serials in the children's sections of newspapers. 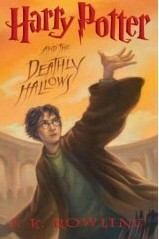 Subsequently made the stories available in books, mostly in 62-page editions. Allowed translations into many languages, sometimes altering the images for socio-political differences between the time when the strips were first written (in Belgium) and the time of the translation for the Scandinavians, Americans, and so on. The beloved Tintin travels the world on adventures of action, mystery, and delight. Tintin, modeled on Hergé's brother, has the innocent affect of a perpetual boy scout. He works as an extraordinary reporter: note that Michael Farr also has worked as a reporter (for Reuters and then the Daily Telegraph) and traveled around the world, so Farr may feel some identification with Tintin. Tintin also works as a brave and honest free-lance sleuth, somewhat as Farr investigates the background behind each of the Tintin books. the detective twins Thompson and Thomson. Michael Farr enthuses over the creation process of each Tintin book, revealing many insights of Hergé's process in making and documenting his masterpieces. Gives historical and social context to the Tintin stories, from The Land of the Soviets to the final and unfinished Tintin and Alph-Art. Shows and compares Hergé's drawings with the reference photographs and other images that Hergé stored for use in creating credible backgrounds and realistic details. Through juxtaposing images of various drawings with their reference material, shows Hergé's skill in turning various complex and messy reference images into elegant and clean-lined yet suitably detailed drawings. Explores of the strip's hero and recurring characters, including how the characters were created and what influenced their creation. Explores of the strip's themes and controversies, and their source in Hergé life, friends, and experiences. Was Hergé a Nazi Collaborator? May 1940: Germany invaded and occupied Belgium, Holland, France. [p. 91] Hergé was in France at the fall of Belgium. He motored home in response to the call from Belgium's King Leopold III "for Belgians to return home and work for the national good". This was one of the ways in which Leopold was perceived as being a Nazi collaborator, resulting in criticism after WWII that forced Leopold to abdicate. The newspaper where Hergé had been publishing was closed by the Nazis. The main French-language newspaper in Brussels was taken over by the Nazis and converted into its mouthpiece, full of praise for the Wehrmacht success. [p. 92] "Hergé was brought on to it (Le Soir) through he friendship with Raymond De Becker ... who later resigned -- and was deported -- rather than be told what to write" by the occupying powers. Hergé did not resign. [p. 99] October 19, 1941: Conclusion of The Crab with the Golden Claws, a year after it was begun. [p. 99] October 20, 1941: Start of The Shooting Star in Le Soir; completed in 7 months and the first Tintin story to appear entirely as a daily newspaper strip. Includes Anti-American and anti-Semitic features that Hergé removed for post-War books. [p. 105] June 11, 1942: Start of The Secret of the Unicorn and Red Rackham's Treasure in Le Soir. [p. 115] December 16, 1943: Start of The Seven Crystal Balls and Prisoners of the Sun in Le Soir. [p. 116] September 3, 1944: Liberation of Brussels; Le Soir closed down. [p. 116] September 8, 1944: "Inter-Allied High Command issued an order proscribing from work those who had been employed by the collaborationist press during the occupation". This included Hergé. [p. 118] Over the subsequent weeks, Hergé was arrested four times for questioning and imprisoned overnight. [p. 119] September 26, 1946: Launch of the Tintin Magazine, at which Hergé was finally employed by businessman "Raymond Leblanc, himself something of a resistance hero". 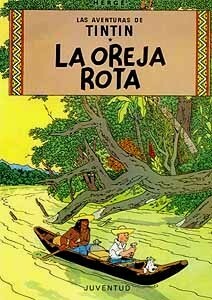 Is it reasonable to discredit Hergé with racism and bigotry? Time and again, Hergé depicts non-whites with stereotypic negative characteristics, only to claim innocence and surprise when these issues are pointed out and to make the changes necessary to satisfy his intended market. Farr's book juxtaposes images from the books with photos and clippings from Hergé's files; comparison shows how Hergé strove for 'reality' and contemporary images in his art. Hergé create as realistic a world as possible for his cartoon hero. the Tintin book, in alphabetic order of English title. the Tintin book, in chronological order of initial publication. Home. Basic Buddhism. Basic Buddhism FAQs. Forests of California and Trees of the World. Poetry - Learn How to Write Your Own. Books on How to Write Poetry. Books on How to Read Poetry.